During the 2018 Christmas season, The Parlour Inn in beautiful Stratford will host various holiday celebrations that will include delicious food, vibrant entertainment and plenty of family-friendly cheer. 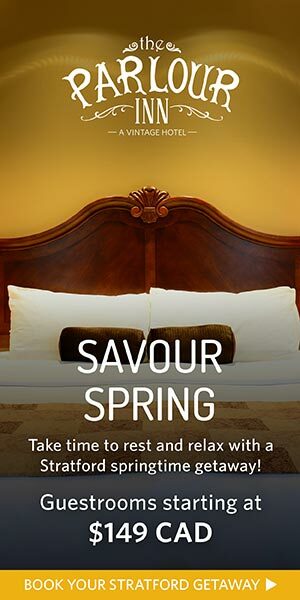 We start the festivities long before Kris Kringle comes to town, so don’t wait to book your holiday getaway in Stratford. We look forward to welcoming you and your loved ones to partake in all the experiences our charming town and gorgeous boutique hotel have to offer. Throughout November and December 2018, we’d love to see you at the Parlour Steakhouse, a celebrated gastropub that features local ingredients and exceptional culinary creativity, for our Stratford House of Blessing Food Drive. When you come to dine with us, please bring a non-perishable food item in support of this worthy cause. For your generosity, we’ll be happy to give you 10% off your delicious meal. Please note, taxes, gratuities and beverages are not included, but an award-winning meal and our sincere gratitude for your kind gesture certainly will be. The people of Stratford are already in bright seasonal spirits, and we want all our guests to catch the contagious feelings of warmth, generosity and cheer that accompany this amazing holiday. That’s why, we’re proud to welcome you into our centrally-located hotel to celebrate with festive treats, surrounded by decorations that pay homage to Ontario’s winter wonderland. Date: Friday, November 23, 2018 – From 7-9 p.m. Whether you’re a parent or grandparent, you know one of the very best parts of the holidays is witnessing the joy children find within each and every component of Christmastime. 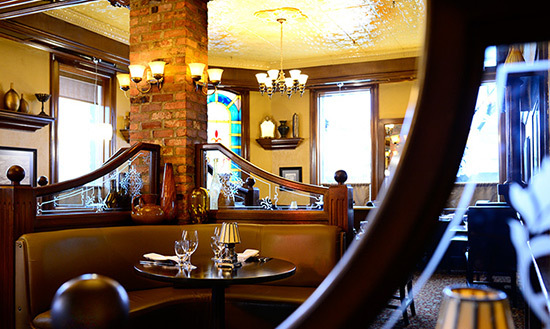 At The Parlour Inn, we love to provide accommodations, dining and experiences that are suitable to the young – and the young at heart, so we can all come together to keep the Christmas spirit alive. Join us for a holiday-themed breakfast with Santa and be sure to get your picture snapped with the man in red, as you ensure he checks off all the items on your kids’ Christmas wish list. For little ones under 12, we will host a colouring contest – until December 15 – where they have the chance to win a $25 prepaid Visa card to kick-start their holiday spending. 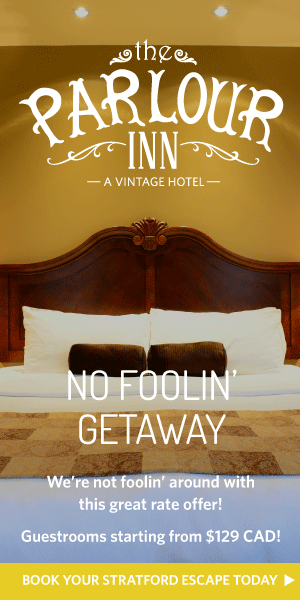 Dates: Sunday, November 25 and Sunday, December 2, 2018 – From 10 a.m. to 1 p.m.
Stratford is famous for its lively Santa Claus Parade, so to extend the celebrations, The Parlour Inn hosts a post-parade get together in our gorgeously decorated historic inn. Warm up with hot chocolate and cider, while you munch on some freshly baked holiday treats in a cozy atmosphere surrounded by the people you love and the new friends you’ll make from the North Pole. Date: Sunday, November 25, 2018 – From 5 to 7 p.m. Ugly sweaters may be the most feared and celebrated component of the Christmas season, so we’re going to put the class back into your hideous cashmere by hosting a night of holiday cocktails and appetizers in the heart of Stratford. Bring your loved ones to The Parlour Inn for the chance to win a prize for the party’s ugliest Christmas sweater. 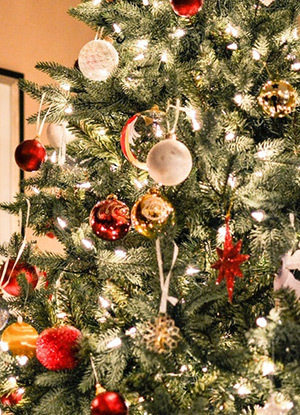 Date: Friday, December 7, 2018 – From 8 to 11 p.m.
During the holiday season, when you walk into the charmingly decorated Parlour Inn, you’ll be greeted by a brightly lit Christmas tree that is adorned with more than just lovely ornaments. This tree offers hope to children within the area, as we encourage each of our guests to take one of the ornaments from its branches and replace it with a new, unwrapped gift for a little one in need. Please visit The Parlour Inn prior to December 14 to participate in this festive tradition and give the gift of a joyful Christmas morning to a child who may otherwise go without this holiday season. From 11 a.m. to 3 p.m. on Christmas Day, come to The Parlour Inn for an exceptional brunch menu that will combine all your familiar holiday favourites with elevated culinary components that reflect our Executive Chef’s dedication to farm-to-table practices. From freshly baked pastries through to a traditional serving of turkey, glazed ham and poached salmon, your mouth will be watering as soon as you are greeted by the sweet and savoury smells of an elegant brunch your whole family will enjoy. Come to Stratford where holiday cheer is in abundance amidst charming accommodations and superb dining experiences. 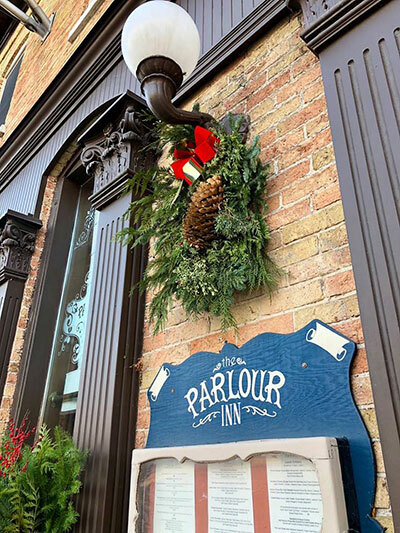 Visit The Parlour Inn during the holiday season for unique events that put family, food and festive fun at the forefront. Book your Stratford getaway in beautiful boutique accommodations, so you can get a fresh start and enjoy Ontario’s most charming Christmastime wonderland. We look forward to filling your festive cup with an excess of holiday cheer.